A Physical Planisphere wherein are represented all the known Lands and Seas, w.th the Great Chains of Mountains w.ch traverse the Globe from the North Pole. This is a beautiful 1757 Philippe Buache map of the world represented on an unusual polar projection rendered from the North Pole. The map covers from the North Pole Arctic region south beyond Tasmania (Van Diemen's Land) to include parts of New Zealand and even Cap de la Circoncision (Bouvet Island). 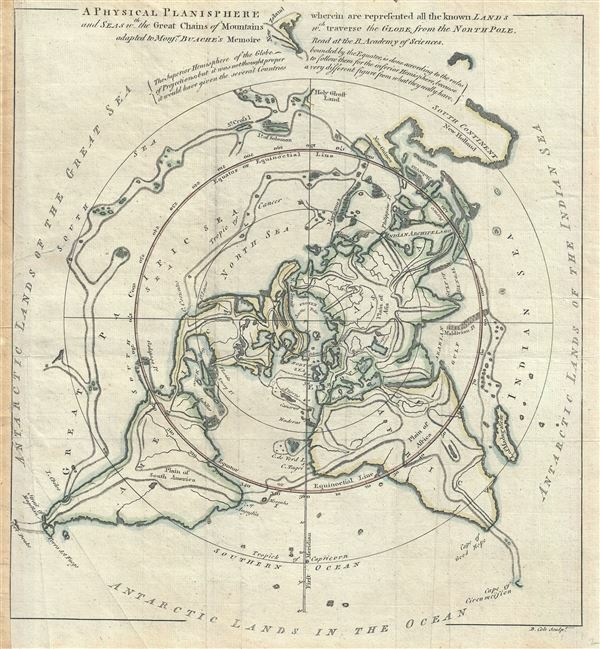 This curious projection has its origins in a 1752 essay presented by Philippe Buache to the Royal Academy of Sciences in Paris. This paper, Essai de Geographie Physiqueâ€¦, argued that the Earth's great river basins are defined by major mountain ranges, many of which extend beneath the oceans. The map's delineation of physical geography, both on the surface and below the sea support this theory and, true to form, Buache has added additional heretofore unknown mountain ranges where necessary. Some of these include speculative mountainous regions in the northern Sahara, bisecting central India, along the Orinoco basin, and connecting the islands of the Pacific. Additional elements of interest include various pre-Cook notions of world geography. Among these is an uncertain mapping of eastern Australia connecting it to New Guinea and some smaller Melanesian islands identified here as Terre du St. Espirit, in fact the New Hebrides mis-mapped by the near insane 17th century Portuguese navigator Pedro Fernandes de Queiros. Buache also includes a magnificent inland sea, called the Sea of the West or in this case the Mer de L'Ouest, in the northwestern part of the America. This body of water, alternatively called the Sea of the West or Baye de l'Ouest, was speculated by Philippe Buache and Delisle in the early 18th century based upon wishful thinking, American Indian stories, and the somewhat questionable 16th century explorations of Juan de Fuca. Here Buache gives the Mer de l'Ouest its fullest expression, though he specifically does not connect it to either the factual network of lakes and rivers extending westward from the Hudson Bay or to the speculative De Fonte network just to the north. This map was based on an earlier Buache map first issued in 1752. The present example was engraved by B. Cole and issued as part of the March 1757 edition of The Gentleman's Magazine. Very good. Minor wear along original fold lines. Some edge wear near top margin. Minor toning over left margin where map was attached to magazine. Minor foxing.